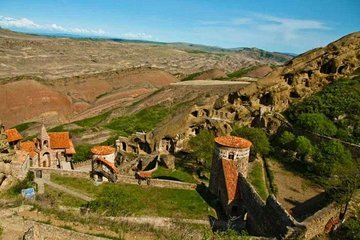 Venture to the semi-arid desert of Gareja on a small-group day trip from Tbilisi. Explore the Lavra Monastery that was founded in the 6th century before walking up to Udabno Monastery and taking in the views of the Georgian countryside and neighboring Azerbaijan. Udabno is famous for its many thousand-year-old frescoes of biblical scenes such as “The Last Supper.” After a quick rest, head back to Tbilisi.